one family movie in America. Being the Disney fanatic that I am, I’ve been counting down the days until the movie release. I went and saw the movie the day it opened, then went back and saw it again two days later. Loosely based on Hans Christian Andersen’s “The Snow Queen,” the story depicts the life of sisters Elsa and Anna. Elsa is born with the powers to create snow and ice. One day while she and her sister are playing in their home Elsa accidentally strikes Anna in her head, causing Anna to get ice in her head. Their parents come home and see what has happened and take Anna to get help. They are able to remove the ice but they also remove all her memories that include Elsa’s power. Elsa hides from everyone and starts wearing gloves to conceal her powers. When the girls are older, their parents set off on a boat to trade with another country, however, their ship is consumed by waves. The sisters are left with only each other. Three years later, Elsa has reached the age to be coronated as Queen of Arendelle. Anna is so excited about being able to venture outside of the castle that she instantly falls in love with the first man she sees, Hans, and they get engaged. Elsa refuses to bless the marriage, and out of anger Anna rips her glove off and Elsa’s powers are exposed. Everyone thinks she is a monster so she runs away to the North Mountain and creates a castle of her own. What she doesn’t know is that she has created an eternal winter in the middle of summer. Anna chases after her and tries to convince her to come back to Arendelle. Out of anger, Elsa accidentally strikes Anna with ice in her heart. The only way to remove the ice is to perform an act of true love. Anna comes back home to find Hans and have him kiss her only to find out he has been scheming and never actually loved her; he just wanted to become king. He leaves Anna to die and sets out to kill Elsa. Anna is able to gain enough strength to escape the castle and sees Hans about to kill Elsa. She runs between them and freezes to ice just as his sword is coming down. Elsa is horrified that she made her sister freeze to solid ice and hugs her. I won’t say what happens next other than, of course, everyone lives happily ever after. When the movie started, it seemed like the normal, cliche Disney movie. Castle. Dead parents. Magical powers. It’s all predictable. The ending, however, may or may not have caused me to cry. I expected Hans to kiss Anna and the spell would be broken, so I was taken off guard when the princess stereotype was broken. The animations of the movie are beautiful, it is written with just the right amount of seriousness and childness, with tons of sing-a-long songs. Frozen is more like some of the older Disney movies, being that it is a musical. Despite the problems that arise for both Elsa and Anna, they are both easy to love. Elsa isn’t evil. Although she has powers that cause issues, she later learns to control them and never purposefully harms anyone. Anna is the perfect representative of a little sister: eager, careless and dizzy at times. When the moment arises though, she will do whatever it takes to save her sister and gain the relationship back that they once had. If you love Disney but are sick of the normal “once upon a time” settings, I would highly recommend this movie. 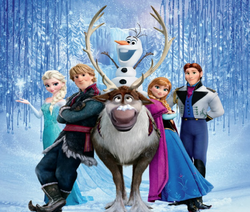 Frozen is unlike any movie Disney has made to date, and is one that I believe will go far past the movies. The movie has enough “dream come true” scenarios to please little kids, while still adding more mature elements to entertain adults.